Việt Nam’s steel industry has high potential to reach a production growth rate of 22 percent and expand export markets this year. However, this will be possible only if it overcomes difficulties such as trade defence lawsuits and high imports, according to the Việt Nam Steel Association (VSA). The sector faced 30 trade defence lawsuits from other countries in 2017, many of which have continued into 2018. These include anti-dumping cases for cold-rolled stainless steel, steel plates and H-shaped steel as well as trade defence cases related to pig iron, long steel and colour-coated steel sheet. By March 2018, Việt Nam had exported 446,000 tonnes of steel products for US$321 million, up 38 percent in volume and 63 percent in value compared to the same period last year. The quality of Vietnamese steel has met the demand of choosy markets, such as the United States, Australia and Europe, rising to top position in regional and world markets. However, in the first few months of 2018, Việt Nam imported 1.2 million tonnes of steel worth $808 million, a drop of 5 percent in volume and an increase of 22 percent in value. 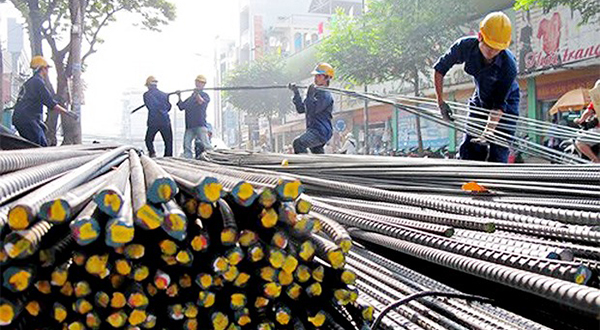 VSA Vice President Nguyễn Văn Sưa said despite a fall in imports and rise in exports, the volume of imported steel remained high. According to him, the domestic steel industry was still dependent on imports as the domestic production process was yet to be synchronised, along with low capacity in producing steel for the mechanical manufacturing sector. Meanwhile, domestic firms are unable to produce many input material products, such as hot-rolled steel and pig iron, thus making production slow and expensive. With the recent market recovery and extensive economic integration, especially the signing of the Comprehensive and Progressive Agreement for Trans-Pacific Partnership (CPTPP) and the upcoming signing of the free trade agreement between Việt Nam and the European Union, the Vietnamese steel sector has the opportunity to expand markets, making the growth target of more than 20 percent feasible. But the fact is when Việt Nam increases steel exports, the import market will strengthen trade defence measures. Trần Tuấn Dương, general director of Hòa Phát Group, said Vietnamese firms should maintain the domestic market, while for export activities, they should adhere to the regulations of free trade agreements and actively cooperate with other countries when faced with anti-dumping lawsuits to avoid losing markets or paying high taxes. According to Dương, market protection solutions are not enough and businesses themselves should enhance their competitiveness and make use of all opportunities for development. A representative of the Việt Nam Steel Corporation said obstacles to exports mostly came from trade barriers and defence measures of importing countries. Therefore, the corporation would continue to improve efficiency in production and business by enhancing market forecasts and having flexible production and business activities according to market development. Despite the lack of capacity and experience, Vietnamese firms could still fight trade defence in the context of integration, the representative said. VSA highlighted the need for cooperation with countries in the face of trade defence problems, along with the development of professional teams to deal with investigation and data gathering to protect steel firms in domestic and foreign markets.